Weight net. 355g. ; 4,50 pln/100g. The velvety consistency of this dressing and its characteristic taste and aroma of blue cheese makes it a great addition to sandwiches, roast and grilled meats, and above all - to salads. Niestety w ogóle nie czuć smaku sera. Przypomina smakiem jogurt z dodatkiem octu. 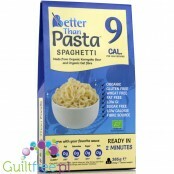 Ingredients: triple filtered water, white wine vinegar, thickener: cellulose gel, aroma of sour cream of non-dairy origin, salt, lemon juice, natural flavors, natural spices, bleu blanched aroma, dried garlic powder, dried onion powder, White pepper, acidity regulator lactic acid, xanthan gum thickener, preservatives: potassium sorbate and sodium benzoate, sucralose sweetener. Contains sucralose sweetener. Ready to use instant mix for preparing a chocolate cake suitable for a ketogenic diet without added sugar and no gluten, based on natural, low-carbohydrate ingredients of organic origin, sweetened with erytrol. New formula! Bolero with stew, no artificial coloring, flavors and preservatives, enriched with vitamin C. Sachet to be mixed with 1.5L of water. 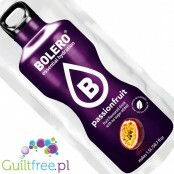 Sweetened with stevia refreshing drink flavored with exotic passion fruit does not contain sugar and has only 1kcal. Cooking spray is an excellent way to save calories from fat in a meal. Ideal for frying, grilling and baking! 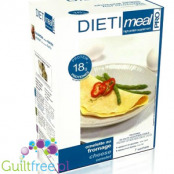 Fry, cook, bake healthy foods without using unnecessary fat.1 tablespoon of oil is 90kcal - replace it with a sneer Oli-Oli Canola Spray, which is 0kcal! Chocolates with sweet strawberry filling without sugar or grams of sugar. 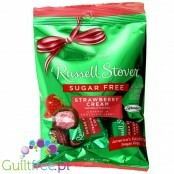 Each chocolat is individually packed - sweet chocolate pralines with delicate strawberry stuffing. A clever snack! 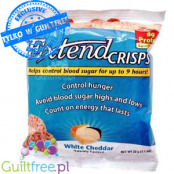 Light and delicious, crisp chips with a taste of cheddar cheese with a low glycemic index IG and high protein content - up to 8g per serving - help maintain stable blood sugar levels. Smaller fluctuations in the glucose level make it easier to control hunger and extend the feeling of fullness for up to 9 hours! Aroma flavored brownie chocolate brownie. Capella Flavors are considered to be the best in the world - these highly concentrated flavors are versatile and water-soluble. Capella flavors do not contain sugar, fat or sweeteners.